Are you in the market for a zero-turn mower? With so many different options available and different companies trying to break into the turf industry each year, the search for the perfect zero turn mower can be overwhelming. However, it doesn’t have to be. Here are a few things to consider when trying to find the right zero turn mower for you and your lawn care needs. However, there is no “wrong” engine size and a lot of this depends on how fast and how much power you wish to get out of your mower. Keep in mind that your hydraulic drive and engine will likely already be paired to fit similar needs by the manufacturer. So, knowing the level of speed or torque you will need could help you make decisions regarding the rest of your mower options. One must also consider the fuel capacity. Residential mowers tend to favor a smaller fuel capacity at about 5 gallons. This keeps the gasoline from getting old and helps to keep the machine running properly. Meanwhile, semi-commercial or commercial mower owners would find the smaller fuel capacity to be inefficient, as much of their time would be spent refilling machines between multiple jobs. Similarly, large plots of land may require a greater size fuel tank of 9 or 9.5 gallons to complete the job. Another important factor when choosing a Spartan Mower is selecting the proper deck size. Spartan deck sizes range from 48 to 72 inches, with multiple options in between. A smaller deck size provides greater maneuverability. This is ideal for residential areas where you may need to navigate around a lot of trees or even a small fence gate. Commercial mowers will probably encounter fewer obstacles and often place a higher priority on coverage. Therefore, they may be okay in selecting a larger deck size. 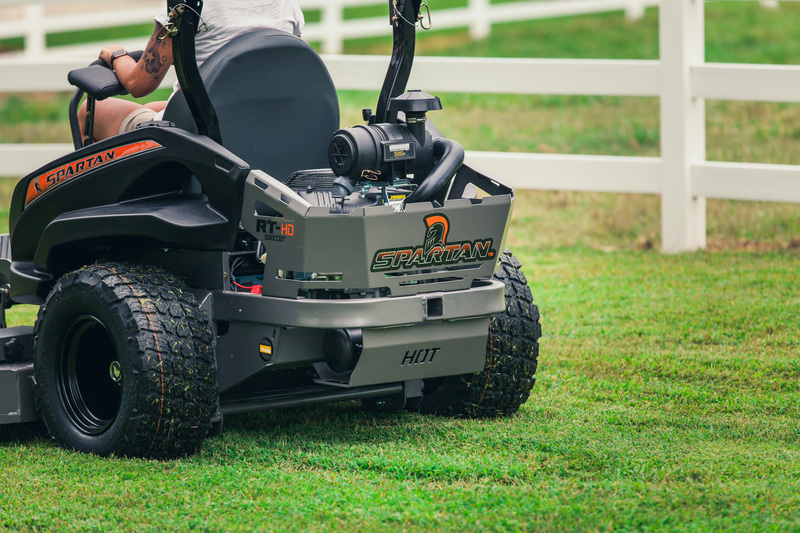 For commercial mowers who do regular work in areas with multiple obstacles, you may choose to balance a larger engine with a small deck size. The new Spartan Heavy Duty Cat Diesel Mower would be a good option as it provides many of the high performing commercial features with a smaller 61-inch deck size. Adjusting the cutting height on your mower should be a quick and simple process. Many lawns have large tree roots, uneven ground, or rocky areas that require shifting the cutting height multiple times to create a complete, clean cut. A foot assist easy-lift deck comes standard on every Spartan Mower and can help provide increased leverage compared to hand levers. This increases overall usability and helps to increase the efficiency of your mower. Mowing your lawn should be an enjoyable experience, and comfort is a key factor in mower usability. You should consider how comfortable the seat is to sit on, the level of back support, and how easy it is to see/use the controls. 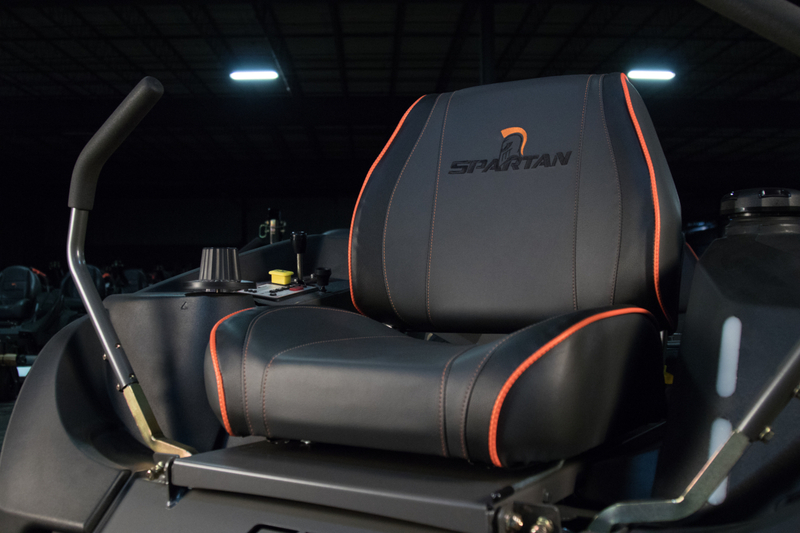 Standard features on every Spartan ZTR include the GT Trac for the best incline traction, easy touch brake system, the ergonomic cockpit, foot assist easy-lift deck, push start instrument panel, and a simple design that makes changing out accessories and routine maintenance a breeze. The Spartan SRT models, including the limited edition Mark Martin SRT and newest Cat Diesel model, also come equipped with the Smart Ride Technology package. Shock-absorbing cushioning, soft ride rear radial tires, and the addition of a neoprene torsion bar help make the SRT models the smoothest riding mowers on the planet. 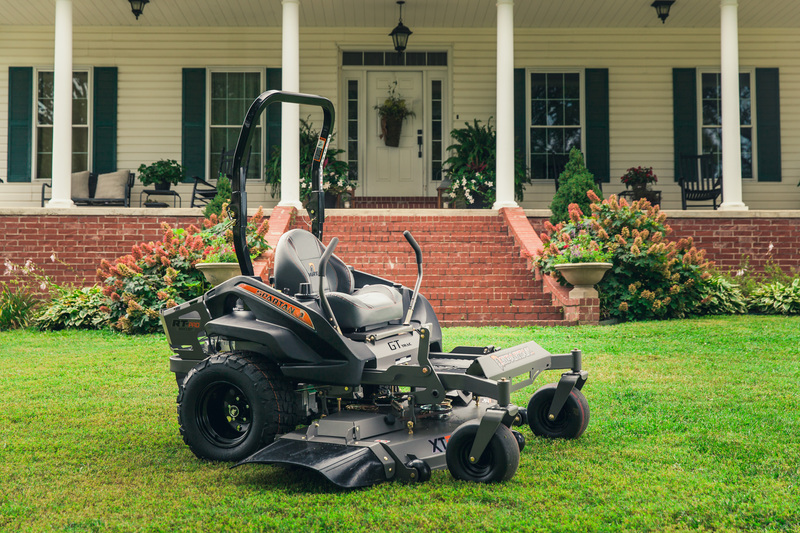 You will spend a considerable amount of time on your zero-turn mower throughout the year, and it’s important to find a mower that meets your personal comfort needs. From our residential Spartan RZ Series to our Spartan Heavy-Duty CAT Diesel, we offer a wide range of zero-turn mowers to fit the needs...and the wants of those looking to find the best zero turn market on the market. For maximum customization, check out Spartan’s Build Your Own Mower tool. It helps provide a fast, user-friendly way for customers to engineer their own brand of greatness. Try it out at https://spartanmowers.com/build-your-own-mower/frame/. You can also compare different models before visiting your local dealer at https://spartanmowers.com/mower/compare/. But honestly, visiting a dealer near you and sitting in a Spartan Mower is the true way to know that these mowers are the real deal and there is a real difference that separates these mowers from the competition.